The Quarterback position contained many known commodities entering the 2017 season, and those players delivered – Lamar Jackson, Baker Mayfield, Mason Rudolph, etc. In 2018, it will be completely different with new names that will dominate the top quarterbacks in the college fantasy football rankings. The former 5 star QB and Texas A&M transfer, Kyle Allen for Houston, came into the season as the starting quarterback. Allen lost the job early in the season and now his future with the team is uncertain as D’Eriq King is poised to take over as the starter in 2018. He finished with 4 touchdowns. In retrospect, CFBDynasty was correctly high on Jake Browning entering his Sophomore season but in 2017, he crippled fantasy owners who took him high in the draft. The Freshman-to-Sophomore seasons saw a jump from 16 touchdowns to 43! But then last season, Browning’s production in that area drastically dipped way down to 19 touchdowns. 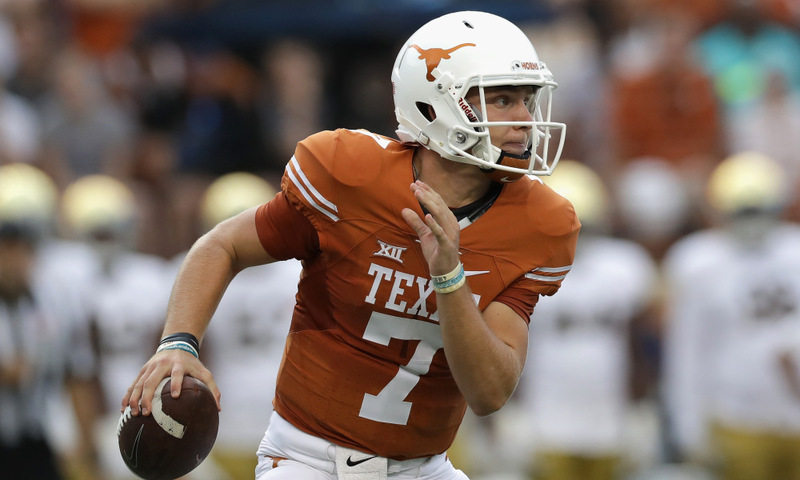 After an exciting Freshman season, Buechele started the opening week slow and took an injury that kept him out for weeks. The backup ended up taking over at the end of the season. All of his metrics were down from 2016 to 2017. The only reason Darnold can be called a bust is because of his sky-high expectations going into the season. He was a shoe-in for the #1 overall choice in the NFL draft, but he didn’t show scouts an improvement in decision making skills throughout his first season as a full time starter. Yards were up, but so were interceptions. Touchdowns actually were down and sacks were way up. In fantasy football, a bust is a bust even if the cause is mostly due to an injury. Stockstill missed 6 games in the middle of the fantasy season. He was also missing his top WR for the majority of the year. After 30 TD as a freshman, then 31 as a Sophomore, CFBDynasty anticipated 40 touchdowns from the seasoned Junior with a favorable schedule. Didn’t happen, Stockstill ended with 16 touchdowns. The former #1 QB recruit Jacob Eason was injured early in the season and never won his job back. The backup Jake Fromm fit the offense better with his running ability and led the Bulldogs to the national championship. Eason transferred to Washington after the season. 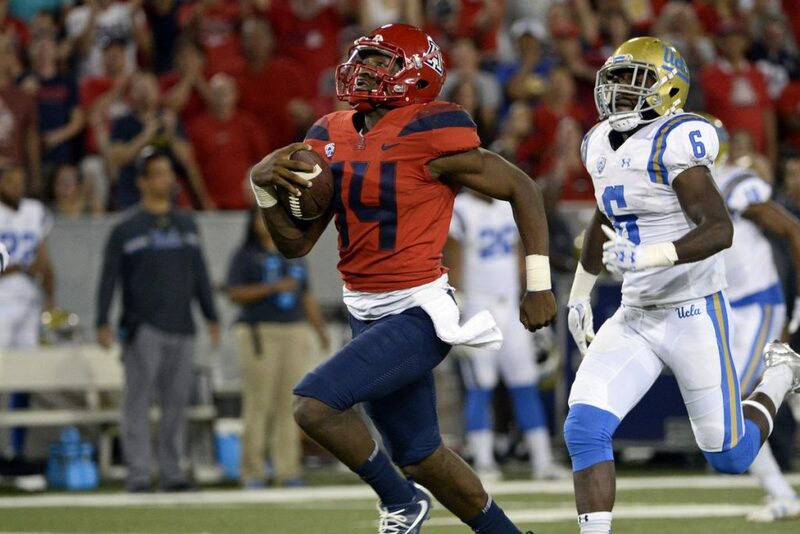 The Arizona Sophomore took over the starting job early in the season and never looked back. It’s safe to assume that Tate will be a top 5 pick in many drafts, and it seems like he’ll be the #1 quarterback in the pre-season college fantasy rankings. He also gets a new Head Coach, Kevin Sumlin which should be a perfect match for his skillset. Milton McKenzie led UCF to an undefeated season and helped many fantasy owners with a consistently high scoring output. He finished the season with over 4,000 yards passing and 37 touchdowns. The former transfer from Florida seemed like a perfect fit with Head Coach Dana Holgerson, and that proved to be true. He quickly found a #1 wide receiver and carved up the Big 12, ending the season with 34 passing touchdowns. His season came to a disappointing conclusion with a broken finger, sadly it occurred during the fantasy playoffs. The Junior almost doubled his production from his Sophomore season, from 2,000 yards to 3,900 and 19 passing touchdowns to 37. He’ll be one of the top fantasy quarterbacks of the pre-season rankings. Tua didn’t get many opportunities to showcase his talent during the regular season, although Saban did a great job getting him first half action throughout the season. After the 2nd half comeback win in the national championship, everyone believes he’ll beat out Jalen Hurts for the job. Alabama may throw it around more in 2018.